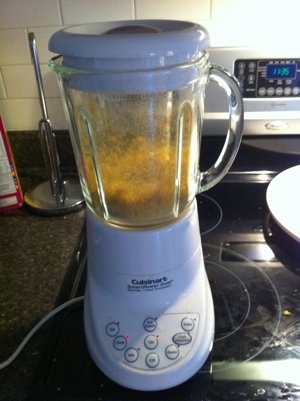 One of my readers (thanks Charles :)) had recently turned me on to something I haven’t heard of before — powdered corn. Although it known by many different names, in the western world it is most commonly referred to as the Spanish word “Pinole”. This “trail food” has been the staple for indigenous cultures world-wide and as it turns out, it’s the perfect bugout/travel food. 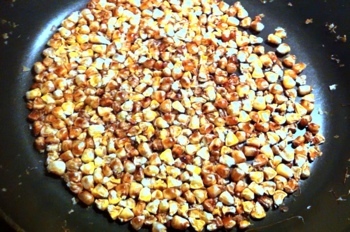 Their Psindamooan or Tassmanane, as they call it, is the most nourishing- and durable food made out of the Indian corn. The blue sweetish kind is the grain which they prefer for that purpose. 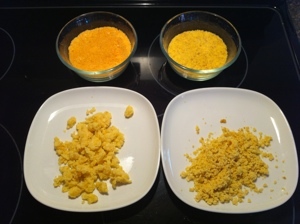 They parch it in clean hot ashes, until it bursts, it is then sifted and cleaned, and pounded in a mortar into a kind of flour, and when they wish to make it very good, they mix some sugar [i.e., maple sugar] with it. When wanted for use, they take about a tablespoonful of this flour in their mouths, then stooping to the river or brook, drink water to it. 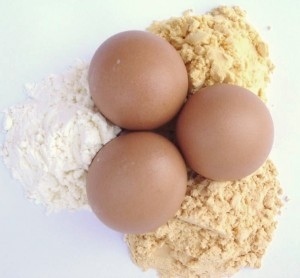 If, however, they have a cup or other small vessel at hand, they put the flour in it and mix it with water, in the proportion of one tablespoonful to a pint. At their camps they will put a small quantity in a kettle with water and let it boil down, and they will have a thick pottage. With this food the traveler and warrior will set out on long journeys and expeditions, and as a little of it will serve them for a day, they have not a heavy load of provisions to carry. 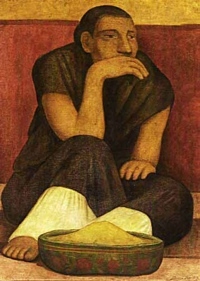 Persons who are unacquainted with this diet ought to be careful not to take too much at a time, and not to suffer themselves to be tempted too far by its flavor; more than one or two spoonfuls, at most, at any one time or at one meal is dangerous; for it is apt to swell in the stomach or bowels, as when heated over a fire. Pinole is also the staple of the famous Tarahumara indians (sometimes referred to as “the running people”), a Mexican tribe of superathletes who run 50 or 100 miles at a time for pure enjoyment, seemingly without effort. Their fuel for these runs? They take with them small sacks of Pinole. 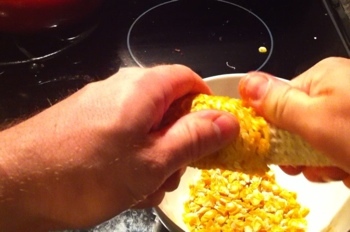 dried corn on the cob: For this you just hang some corn in a dry place in your home until the kernals are dry throughout and come off the cob without much effort. 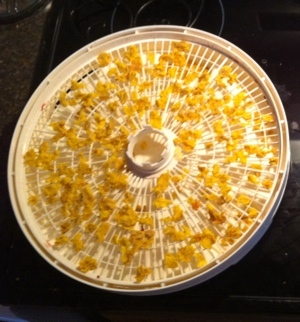 For a less auhentic but still workable solution, you can also dehydrate frozen or canned corn in your dehydrator. 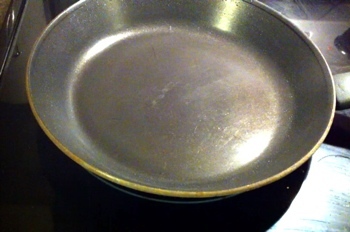 Step 2: Heat up a non-stick pan (or oiled pan if you don’t have one) to medium heat. 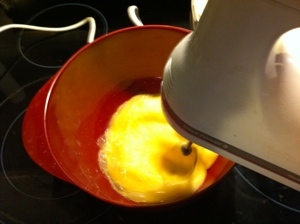 Step 3: Spread out the kernals on the hot pan so that none are on top of another. Heat until the majority swell up and turn round and light-brown. 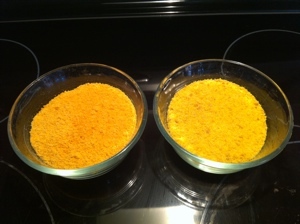 I’d like to add that you can also make Pinole by taking cornmeal and cooking it over a pan in the same manner as above (don’t expect it to swell however). 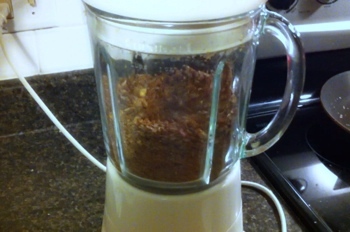 Instead, I preferred to take the tablespoon into my mouth and chug it down with water.Since the Pinole actually tastes pretty good by itself (I used the Tarahumara Pinole Recipe found below), I found this a lot more appetizing. As a side note, I was quite surprised at how much it made me feel full. The Pinole must of swelled inside my stomach after a bit giving me that “full” feeling — and that was only two tablespoons of it. I can see how this would sustain you on long trips. I’ll have to definitely try this out before a run and let you guys know. 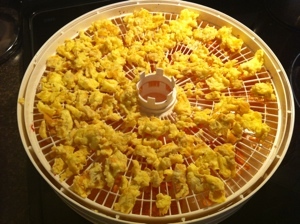 This can be quickly blended together in a hot pot or pan and cooled until dry. All of these recipes can be added to water and drunk (1 tablespoon to 3 cups water), cooked down in a pan with water to make a gruel (oatmeal-like consitency), or just shoved in the mouth while on the run (bugout, exercise, E&E etc). In place of packing Cliff Bars or MREs into your bug out bags, how about some Pinole instead? If it can fuel the Tarahumara indians for a 100+ miles of running on a regular basis I’m sure it can benefit the prepper’s bug-out to a safe location. Try it out and let me know how it works for you! Whether you’re dealing with a societal collapse or are living/traveling in a remote location far away from any hospital, understanding how to treat medical issues where there is no doctor around is of prime importance. Perhaps the two most well-known books available for this type of information are the Where There is No Doctor and Where There is No Dentist books put out by Hesperian Health Guides. 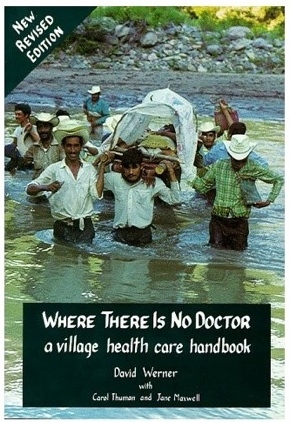 These books — especially Where There is No Doctor — have become the “bible” of primary health care for community health workers and villagers in poor countries around the world (and popular among the survivalist community might I add). Both books use simple language and hundreds of drawings (not world-class illustrations by any means but they do their job) to teach the layman about recognizing, treating and preventing common illnesses and injuries – it goes way beyond simple first-aid information. Night-vision devices have come quite a long way since the Vietnam 1st-Generation optics. And as technology has improved and production costs have come down, demand continues to grow in the civilian market. One of the premier night-vision technologies that the military and law enforcement use on regular basis is forward-looking infrared. This technology allows the viewer to see differences in thermal radiation that objects give off, clearly contrasting an individual or animal from its background. Since most night-vision devices (Gen I – Gen III) require some amount of ambient light to work (and will not work in the day), flir devices have a clear advantage (no pun intended :)). Despite the obvious benefits for preparedness-minded people such as yourselves, this technology has been too expensive to make it worth while. However times are changing. FLIR, the company which has pioneered this technology, is trying to increase its position in the civilian market. And along with this they will soon be releasing a FLIR monocular/camera called the “Scout”. See people: Keep track of the rest of your hiking or camping party – in the darkest nights, and even when they’re obscured by light foliage. See animals: everything gives off heat, so animals can’t use their natural camouflage to hide from Scout. Discover those hard-to-spot animals that you’ve always wanted to see, day and night. Track game: – sportsmen can use Scout to track wounded animals by following their heat signatures directly, or by detecting signs they leave behind like blood trails and foot prints. 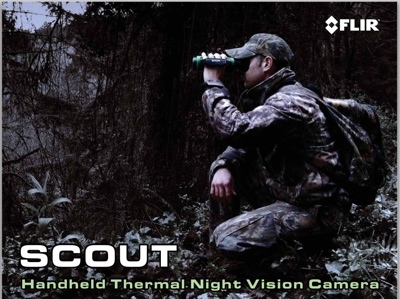 Stay safe: – Scout’s thermal night vision technology lets you see clearly through smoke, dust, and light fog so you can stay safe in the outdoors when conditions deteriorate. Lightweight and rugged – Scout is rugged, fully submersible, and built to last. Weighing less than a pound-and-a-half, it won’t drag you down. See more, and see farther, than with other night-vision technologies because Scout sees clearly without any light whatsoever, it can see farther at night than other imaging technologies that need ambient light to work, and can see heat sources that these other cameras could never find. There are dozens of at-home uses for Scout as well including home security, location of heat leaks, and detection of water damage. Its ¼ x 20 tripod mounting hole and video output make it easy to mount on an ATV, pickup, or SUV. Without officially testing this, I can in no way provide a strong argument either way. But this looks like a great piece of equipment and the capabilities look amazing! So how much for this bad-boy? For the Scout the company is quoting around $3000. Not cheap, but it beats the prices a few years back of around $10,000+. Still, I’d like to give it a bit more time to let the idea percolate inside my head. 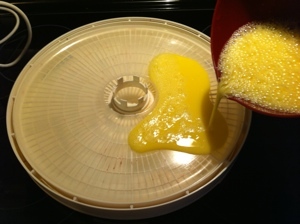 If you’ve read any of my other articles on food storage, then you’ll know that I always stress the importance of rotating and using your food storage now — this includes your long-term bulk-food items such as sugar, dried milk, wheat, flour, grains and legumes. Not only does this force you to figure out how best to use these items, it also gets you and your family used to eating what you one day may need to rely upon. 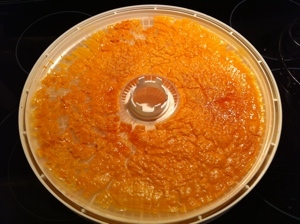 The problem with bulk foods is that most people tend to store them in large, air-tight 5-gallon buckets (as I do), and once you peel back the seal strip and open the bucket, the seal breaks and forever loses it’s air-tight sealing properties. This obviously doesn’t lend itself well to reuse. And since you’re most likely not living exclusively off of your long-term food storage, it will take a bit of time to go through say a 5 gallon bucket of wheat or dried milk — increasing the potential of it spoiling or getting infested before it’s used up. 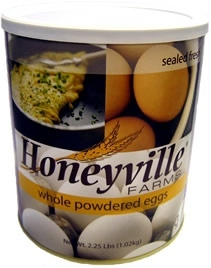 Up until recently, when I opened a bucket, I would transfer my bulk food from it to smaller individual mylar bags. 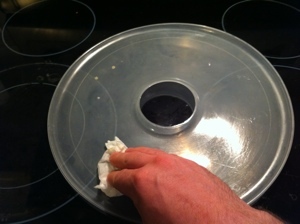 This was before I found out about Gamma Lids.